Hotel Balderdash was a FAVORITE show of mine when I was a kid. It was a cartoon show hosted by Cannonball and Harvey (I don’t remember Raymond). In fact, I LEARNED the meaning of the word “balderdash” because of the name of that show. 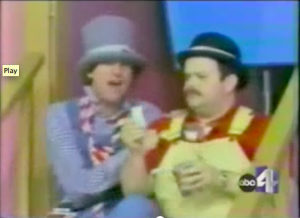 Here is a nostalgia clip that KTVX did about it. For Halloween, I was looking for video about it on YouTube and found Hotel Balderdash instead. Just hearing that theme song brought back so many memories! At Hotel Balderdash, I get my morning started right! 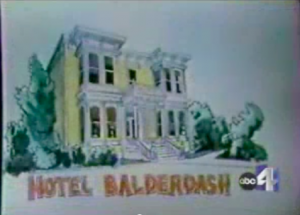 My dream was to someday be on Hotel Balderdash, just like all those kids I saw every day. I wanted to meet Harvey and Cannonball. I really liked Cannonball because he was fat, like me, but he was on TV and really cool, so I thought he could teach me about how to be cool, even though I was fat. I thought maybe he could teach me how to stop the other kids from making fun of me. I never did get to meet Cannonball, but Hotel Balderdash still has a large swath of my childhood memories devoted to it. To this day, I am so grateful to all of the people who made it possible. 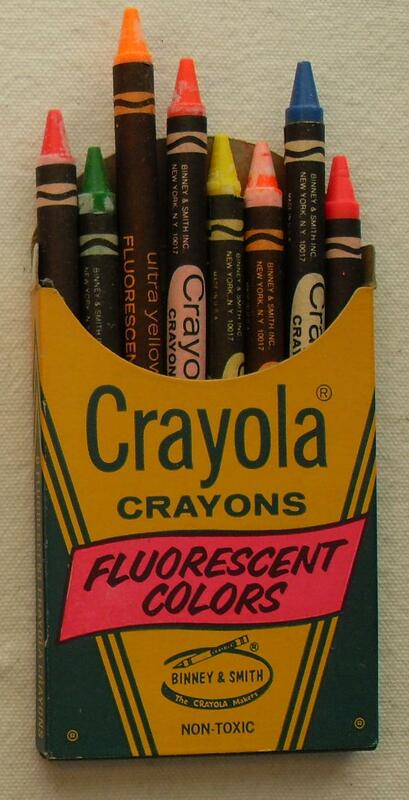 Seeing this box of crayons on Pinterest brought back SO many memories for me. In third grade, I had Mrs. Ellison’s class. She suggested that we get fluorescent Crayons and my mom brought some home from Gibson’s, where she worked. I was the only kid in the class who’s parents bought her those very special crayons. When another little girl stole them from me, Mrs. Ellison knew they were mine and I got them back. It was the first time a teacher believed me over another child and I felt vindicated. Why is it that this old box of crayons spawned that memory, but when I see the newer boxes of fluorescent crayons, I never think about that day my beloved and special crayons were stolen? I got a bottle of Ulta’s Army of 1 nail polish in a free makeup kit that I received because I spent a certain amount of money at the store. I’ve never been particularly impressed with Ulta products, but I ADORE this polish. I’ve never even been a big fan of creme polishes, but this one goes on so smooth and buttery without streaking. I also love to use it as a base for more sheer colors. Tune in tomorrow for an example of that. 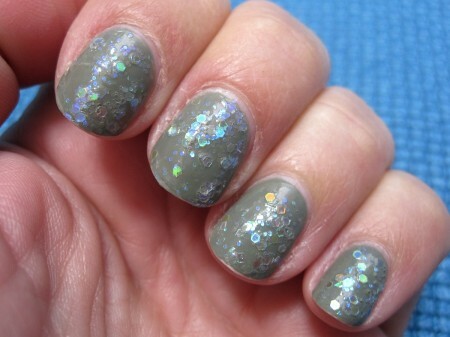 I absolutely adore the look of this manicure. I started out with a base of two coats of Ulta’s Army of 1 nail polish. 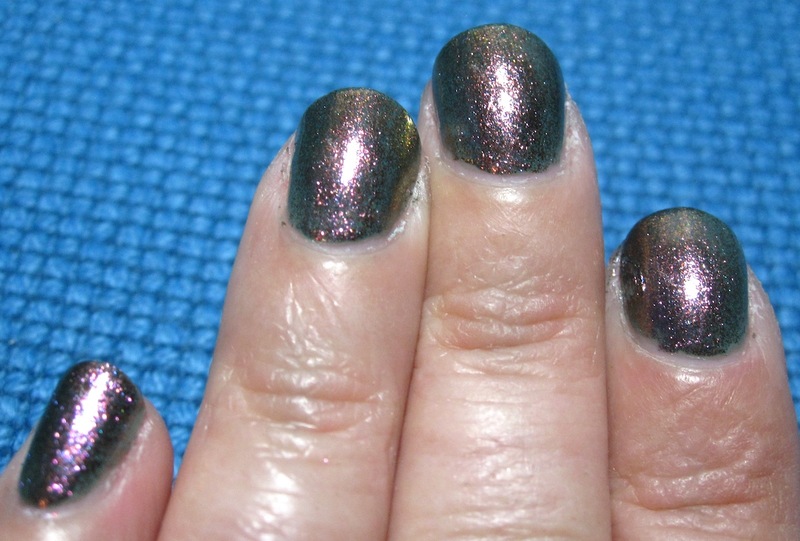 Then I added two coats of Beetle by Hard Candy. This manicure looks so good. I love how Ulta’s Army of 1 is a great base coat for Beetle. The camera can’t fully capture the iridescent hue of Beetle and how it reflects green, yellow and purple depending on the angle of the light. Gorgeous! How I wish I had left well enough alone with this manicure, because what I did next completely RUINED it. Tune in tomorrow to see what happened. 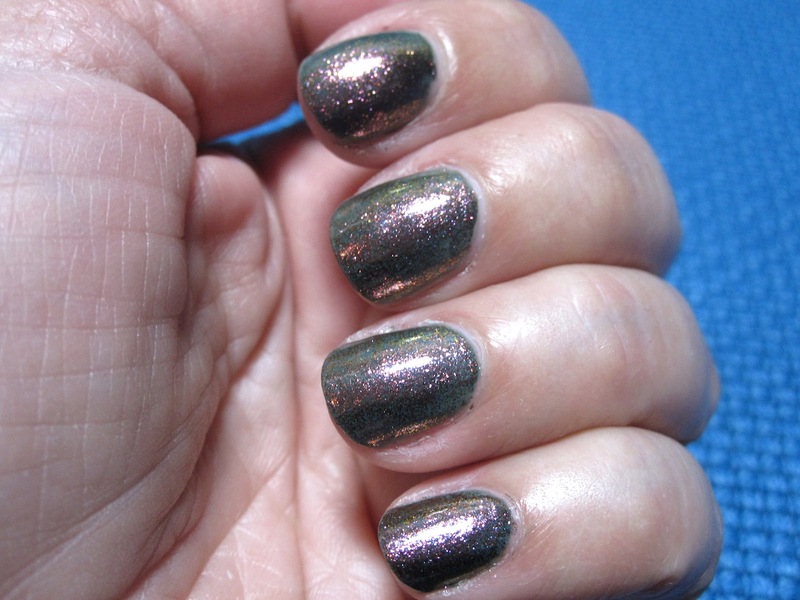 This manicure is an example of “Leave Well Enough Alone.” I started out with a base of two coats of Ulta’s Army of 1 nail polish. After that, I added one coat of the second step of Revlon’s Moon Candy Orbit. 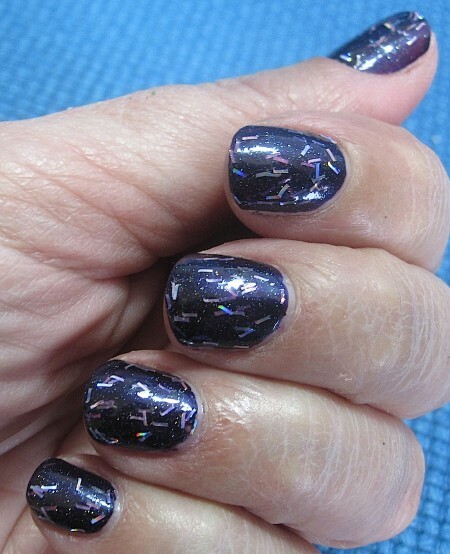 Even though it was only one coat of that polish, the pretty mylar pieces made the manicure feel thick and lumpy. 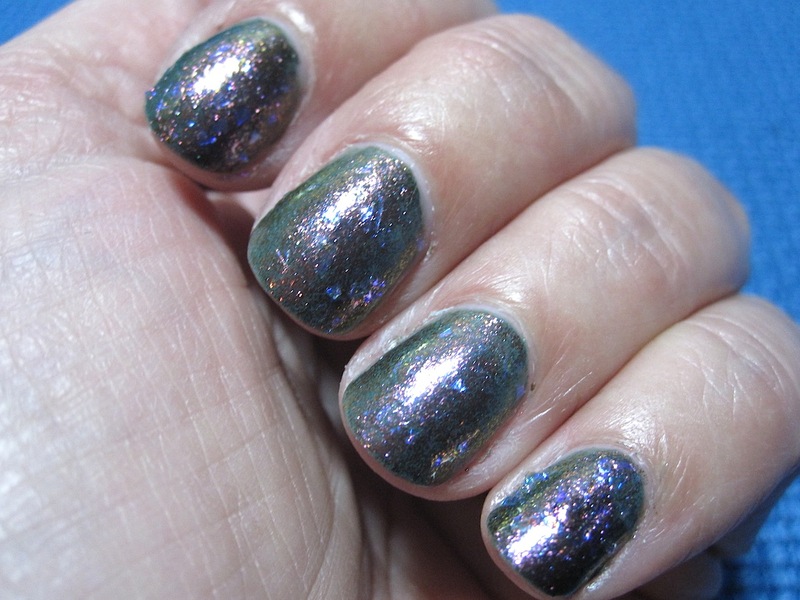 I hated the result so much that I took the polish off within a half hour of it drying. Don’t forget to vote, America. 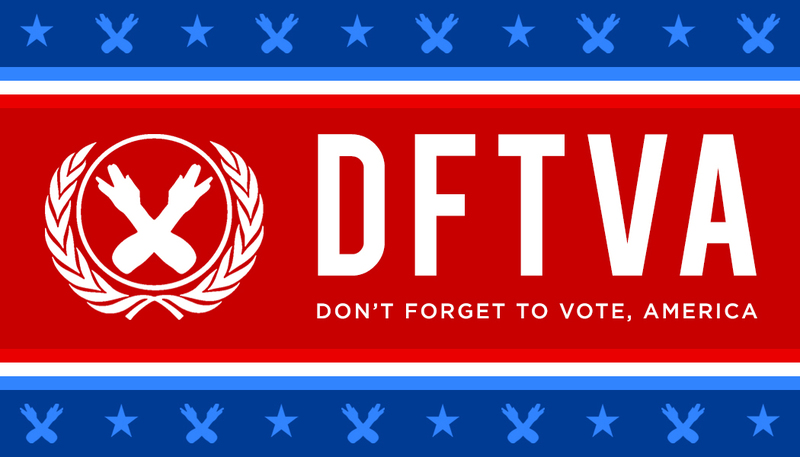 Every time you just blow off voting, the bad guys win. Don’t let the bad guys win. 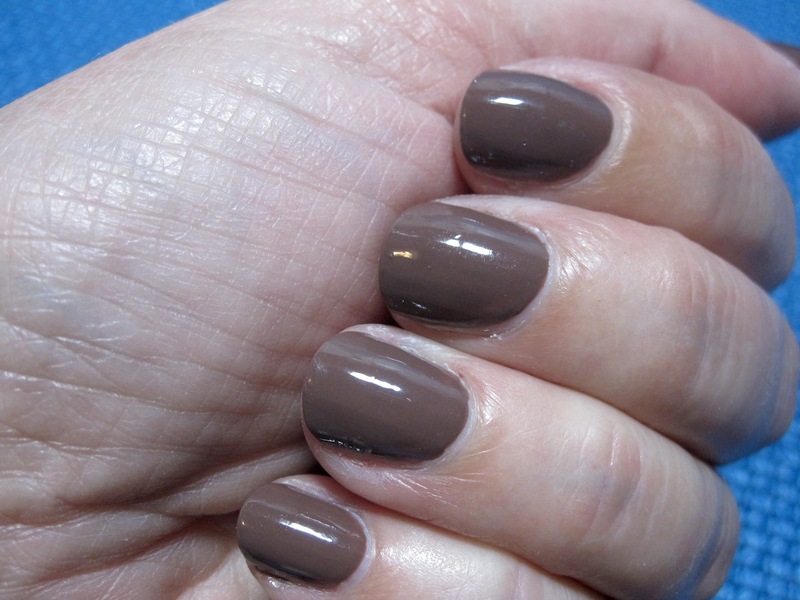 For years, I have looked for a nice, chocolatey creme polish to replace my aging Revlon Java Bean polish that I loved so much. I didn’t want any glitter, even though I’m a fan of glitter. I didn’t want any metallic, even though I’m a adoring fan of metallics. 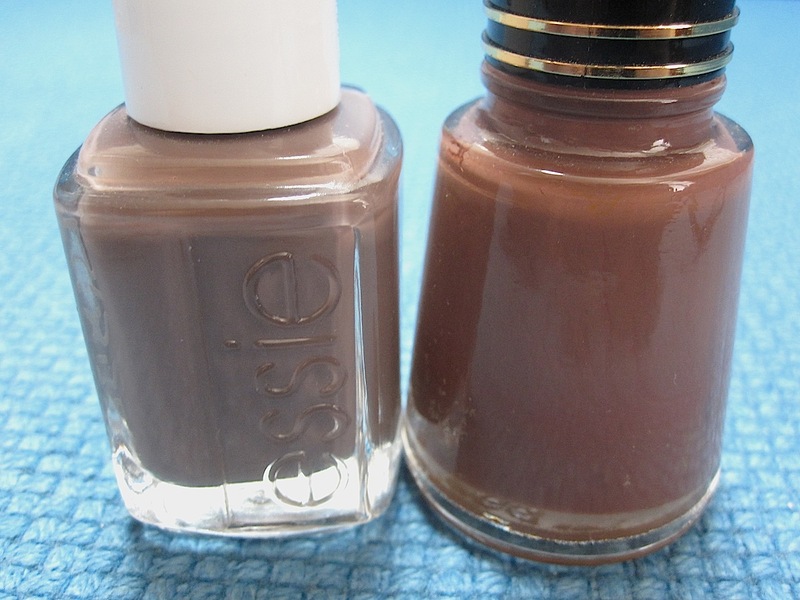 All I wanted was a creamy chocolate brown for my nails. 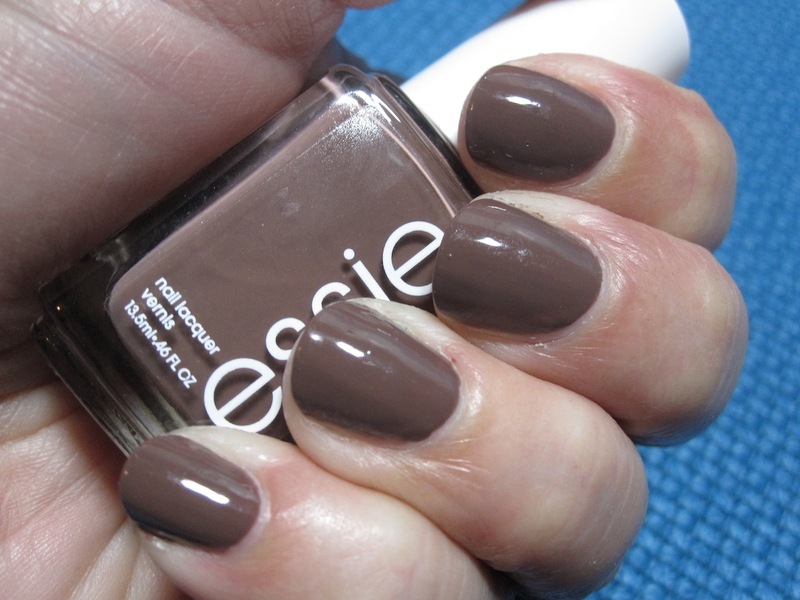 I’ve finally found it with Essie’s Mink Muffs polish. Although not exactly the same hue as Revlon’s Java Bean, it is very close and looks very good with my skin tone. 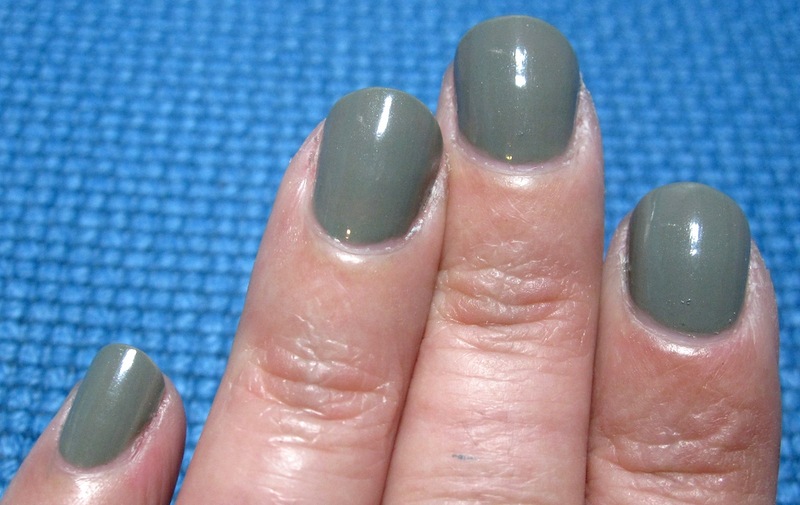 It takes two coats to fully cover the nail without streaking. 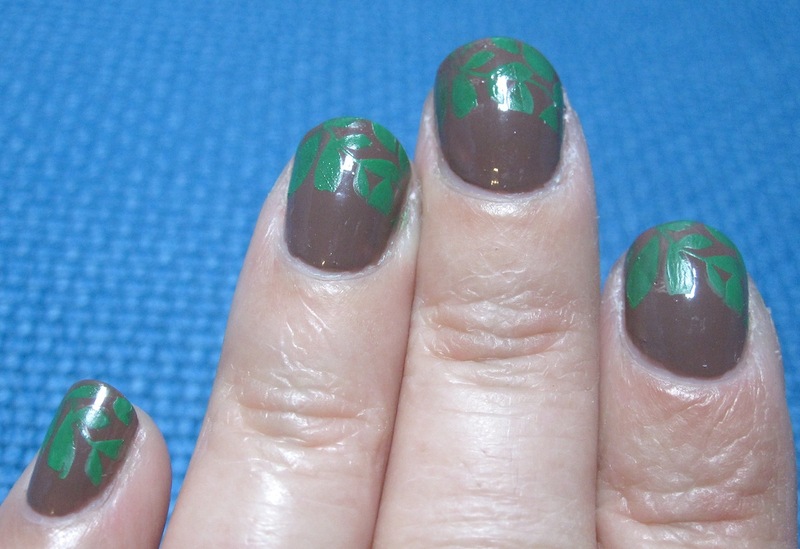 I’ve been pretty happy with this color and how it looks as a base for stenciling. 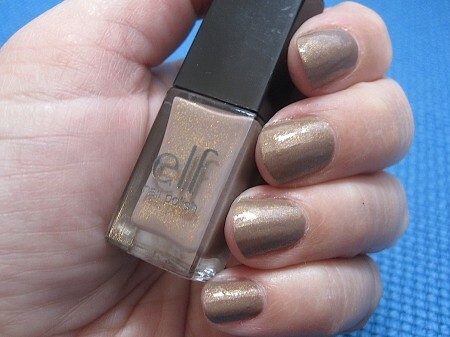 Tune in tomorrow for the Fall Foliage Manicure that uses this polish as a base. This manicure didn’t last me very long because the stenciling at the tips wore away quickly, but while it was here, it sure was pretty, very much like the changing leaves in Fall. 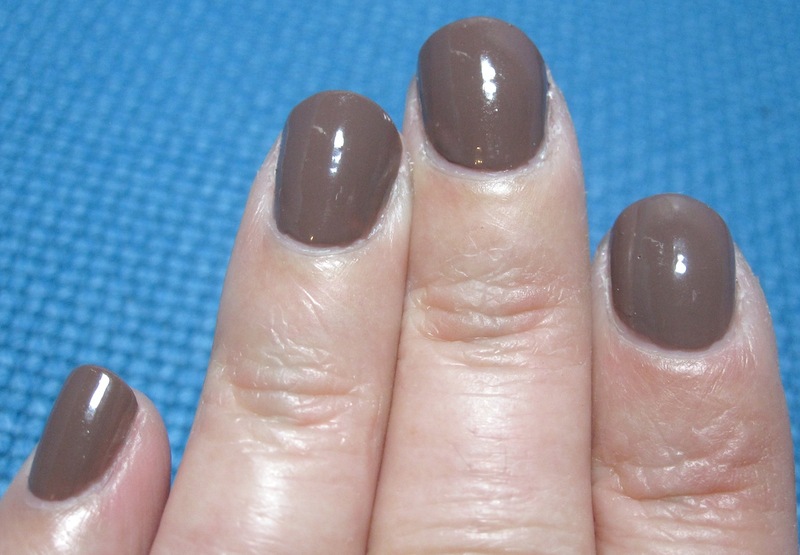 I started with two coats of Essie’s Mink Muffs. 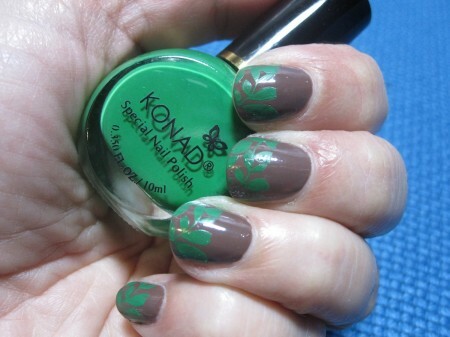 Then I used the Bundle Monster Stamping Plate #BM217 and the Konad Special Polish in Green. 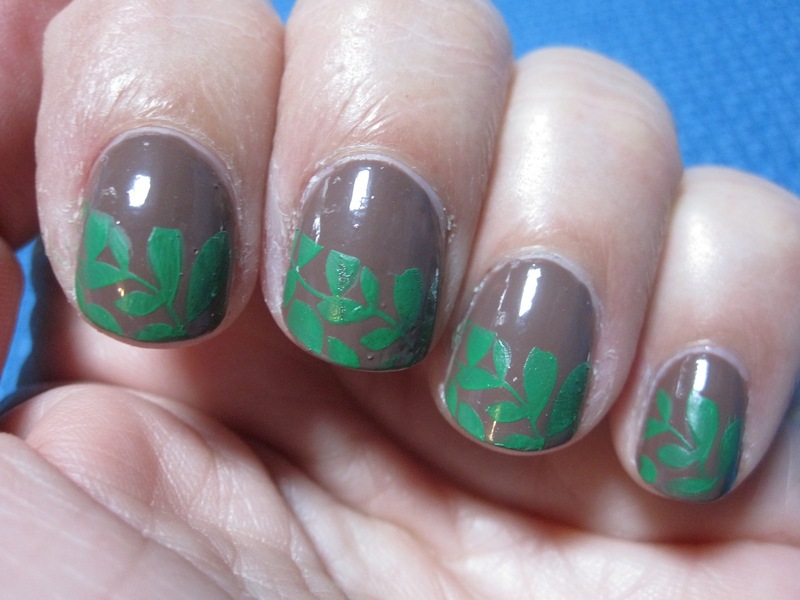 I was going for an autumnal sort of feel with the leaves and the brown. I particularly like how good the two colors look together. The stamping wasn’t quite as clean as I would have liked, but it turned out good enough. Whenever I’m feeling down, it’s always a pick me up to do my nails. 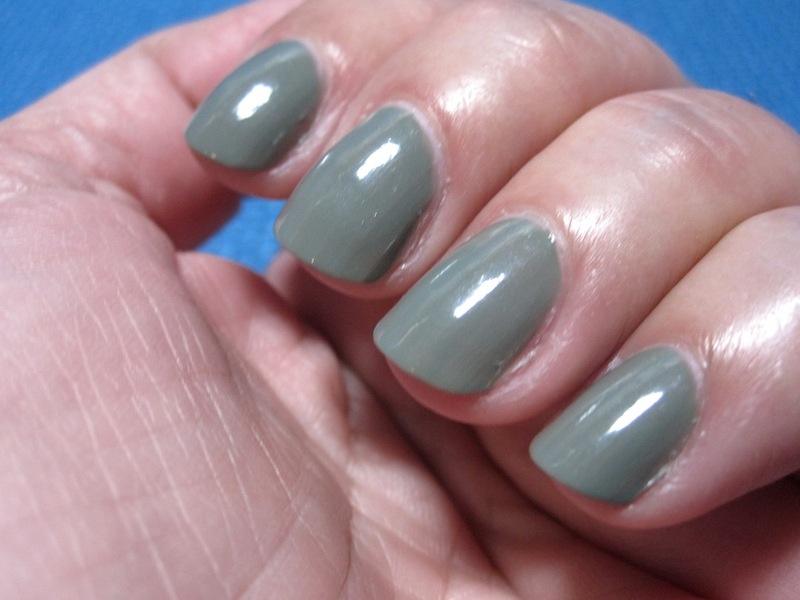 When they turn out as well as this manicure, it makes me even happier. After the failure of Pick Me! » The Leave Well Enough Alone Manicure, I took it all off and tried a new one. I started again with two coats of Ulta’s Army of 1. 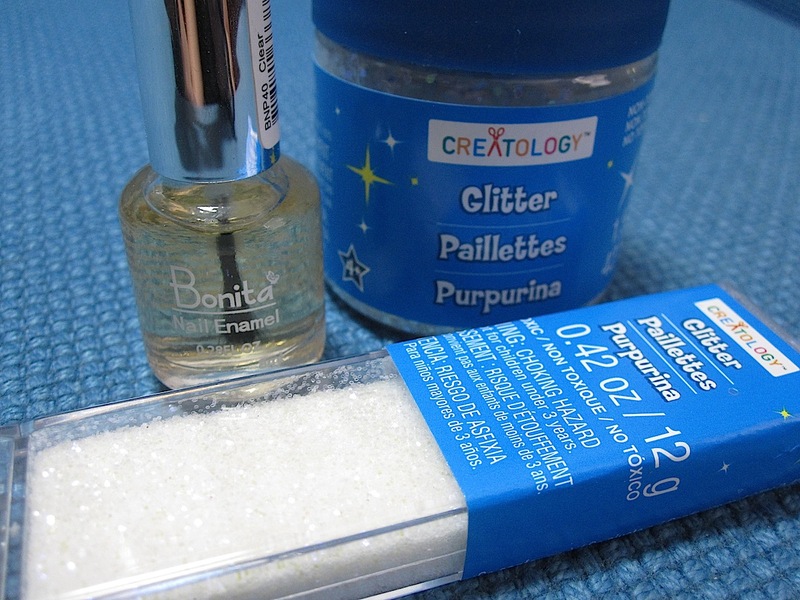 I bought an inexpensive bottle of clear polish and some glitter. 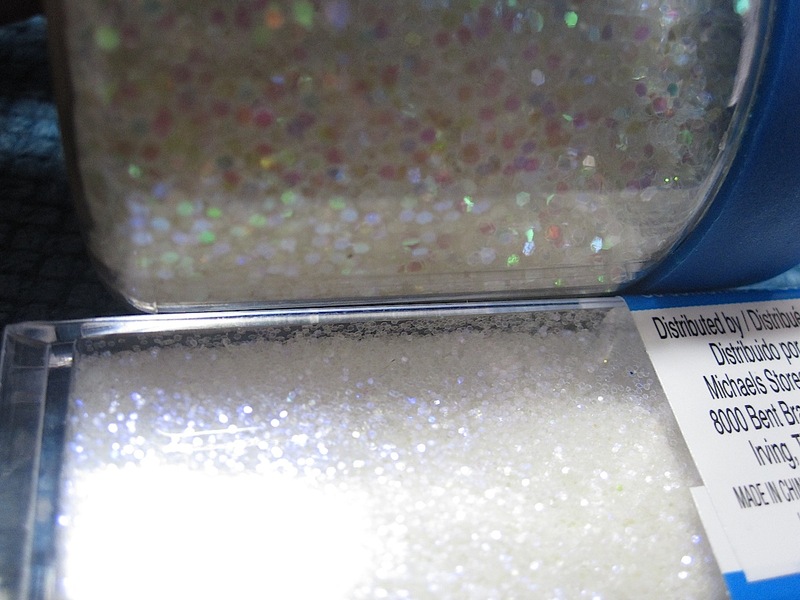 The two kinds of glitter are different in size, because I wanted the polish to be REALLY glittery. I dumped out 1/4 of the bottle and kept adding glitter until it was full. The bottle looks like this now. 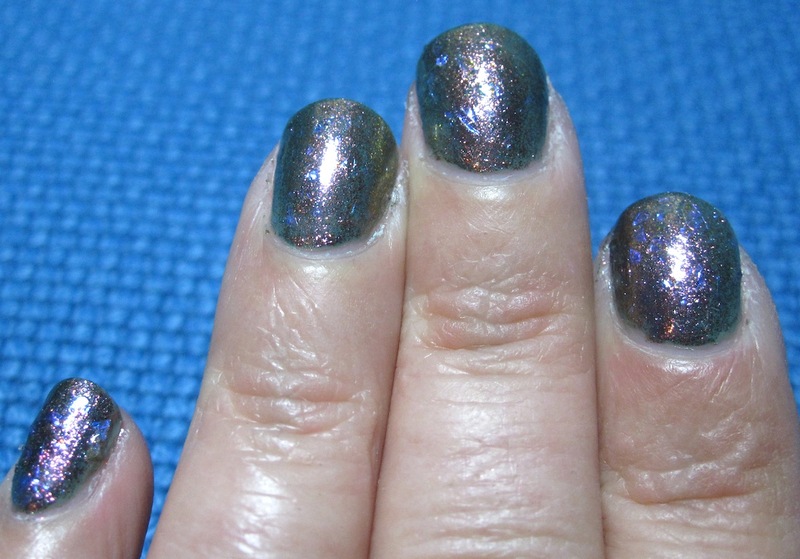 The result was a REALLY glittery polish. 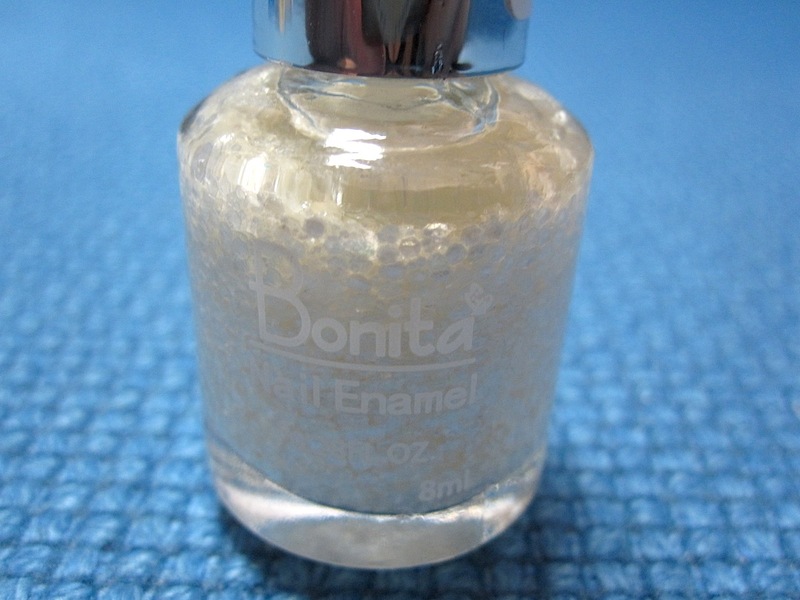 This is ONE coat of the polish. 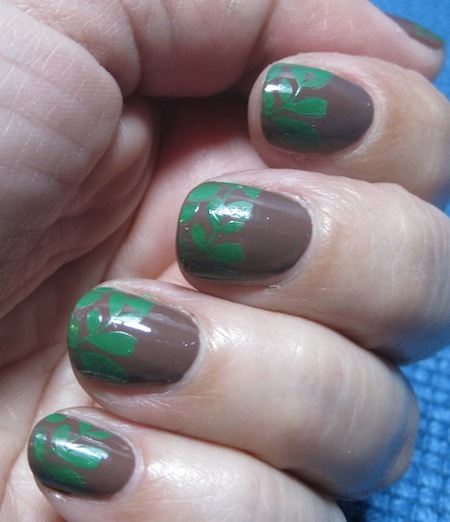 Unfortunately, the polish is really thick and difficult to apply evenly. 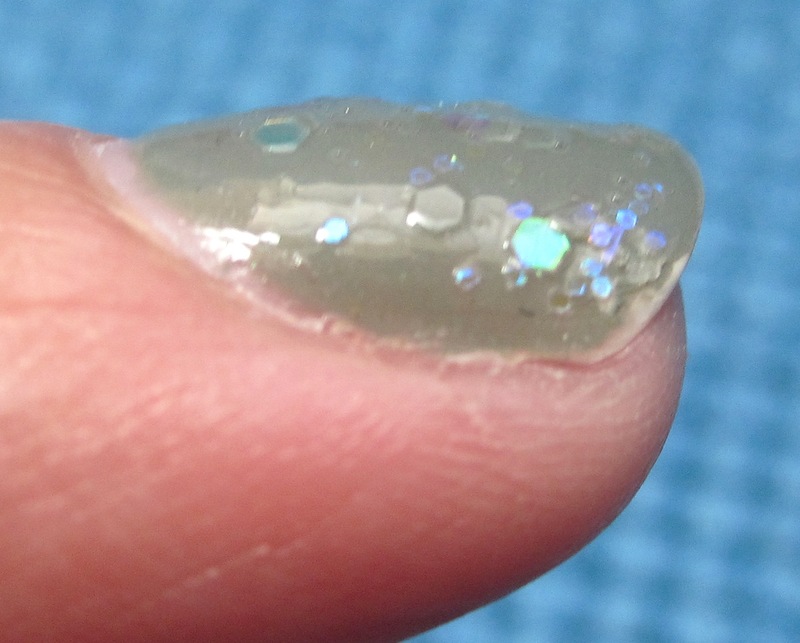 Look at how much it pops up on the nail. In the end, I’ve decided to leave glitter polish crafting to the professionals. They do so much better than I do. I was shopping at Target, when I found this 14 piece nail polish set from e.l.f. I have NO need for more nail polish, but it was so cheap (only 10 bucks!) and I liked so many of the colors that I bought it. I am so glad I did, because I ADORE this set! 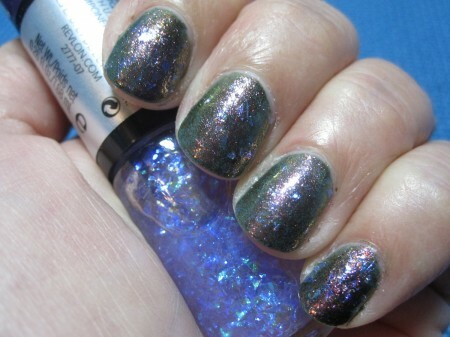 All the colors are VERY pigmented, and I put only ONE coat on my nails for these photos. They were as buttery as Essie polish and covered without streaking as well as OPI polish does. Best of all, the entire set cost less than two bottles of Essie or OPI (as cheap as one bottle of OPI if you don’t know the good places to shop). This set would make a great Christmas present to anyone who needs the basics. There are a bunch of wonderful neutrals in it and the colored polishes are perfect. Every woman needs a good red, a good neutral and a good edgy color. 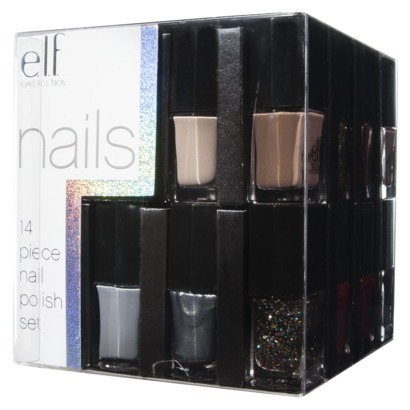 This set has a great selection of all three, so if you think it might be a good present, IT WILL! I have only two complaints about the entire set. Firstly, the lids are asymmetrical, so it’s difficult to get them back on the way they were when I bought them. I hate how they will be sideways on the bottle and I’ve never figured out how to get them back on properly. 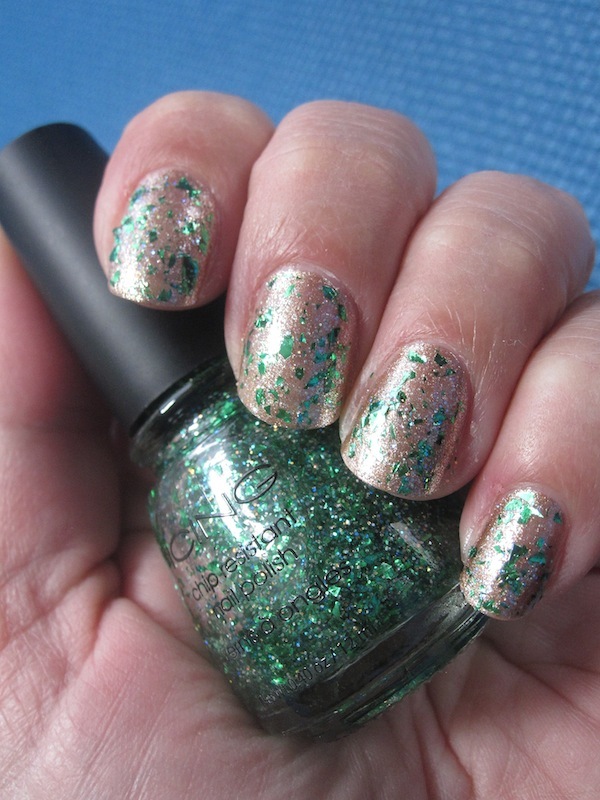 Secondly, the glitter polishes aren’t quite glittery enough for me, but if you’re conservative with your glitter, you’ll love them. My absolute favorite in the group is Glamor Girl. It’s a creamy neutral, but when you catch it in the right light, there is a pop of glittery gold that makes it stunningly glamorous. I have been wearing this manicure for the last few days and I have been quite happy with it. I call it: Shannon’s Violet Velvet Attitude Manicure. Thank you to all the military people out there serving our country. I am incredibly grateful to you for your sacrifice. Here are some touching videos of soldiers being welcomed home. This first one is a beagle welcoming home his owner. I thought, “She must do that to everyone who comes in the house,” until I heard her crying barks. Daisy really did miss her! In 2005, when he came home from Afghanistan, Gracie could hardly contain herself. If you click on the ads, all proceeds go to Alexandria Animal Shelter. This is the most touching one of all. The soldier’s son is having his birthday party when Darth Vader shows up. When he defeats him, he pulls off the helmet to find his father. At the 40 second mark, the little boy screams, “Daddy!” and there’s not a dry eye in the house. If there is a veteran in your life, thank them for their service. I love this animated GIF of a soldier on the way to war, imagining himself back to the banks of a snowy river. Throughout my life, I have imagined myself away from many unpleasant situations. When I was a little kid, I saw a movie called, Tribes. In this movie, a hippie has been recruited into the Marines. He endures the hardship of boot camp by imagining himself away to his hippie girlfriend and the memory of kissing her under a lush and beautiful tree. You can see an example of this at the 5:30 minute mark here. The recruits are being asked to hold buckets full of sand aloft. Adrian is able to hold them longer than anyone else because he has imagined himself away. So much of my view of life was from this movie. I love this scene where Adrian is calm after all their work, talking to one of the other draftees at the 8:46 mark. Once he teaches Sidney, then he, too, is able to hold up the buckets just as well as Adrian. I think I only saw this movie once as a kid, but it made such an impact on me that I can still remember him imagining himself away. I’ve used that technique MANY times over the years to get myself through hard times. The next time you’re trying to achieve something hard, try imagining yourself away and see if that helps you as much as it has helped me over the years. 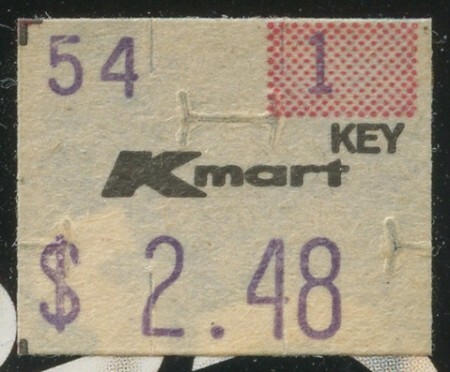 I was reading Neato Coolville today when I saw a blast from the past: a K-Mart price sticker. It brought back so many memories for me. 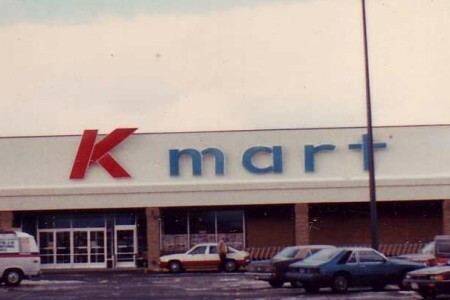 In 1985, I got a job at the new K-Mart in West Valley on 5600 West. We were the first K-Mart in the city to have scanners, but that didn’t mean that we didn’t need to put prices on EVERY SINGLE item in the store. 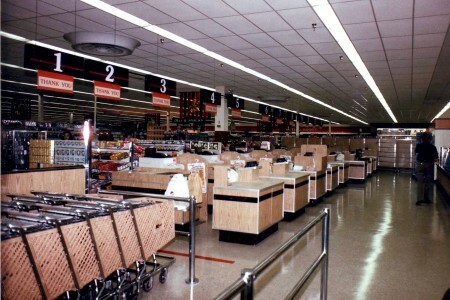 I know it sounds weird, but back then, even though we had a scanner to ring in the prices for us like every store in the U.S. does now (except Hobby Lobby, WTF?! ), we still needed to stick prices on every piece of merchandise in the store. I LOVE K-Mart. That job I got when I was in in my junior year of high school ended up paying for my college. I stayed there for SEVEN years and spent seven Christmas seasons and Black Fridays at the checkouts. Even the Christmas I was a pharmacy tech, I ended up working the checkouts because they were always so busy during that time. That’s why I NEVER go to Black Friday sales. I worked SEVEN Black Fridays. I’ve seen women get into fist fights over blankets. BLANKETS! I listened to that same 45 minutes of Christmas music over and over for two months. I manned the Blue Light Special, braving the throng of people rushing at me. That’s why I cringe at the people camping outside for two days before Black Friday. That’s why I avoid stores during the next month. That’s why I do almost all of my Christmas shopping online. Yet, I still felt a beautiful twinge of nostalgia when I saw that price sticker. YES! That was what my teen years looked like. That little number in the upper right hand corner was the Key Number. That particular product was Key 1, so it was general merchandise. There was a time in my life, when I had all the Key Numbers memorized and I would have been able to tell you whether something was from the Garden Shop or Sporting Goods, just based on that little number in the red square. Our store opened the weekend BEFORE Thanksgiving, so our Grand Opening beat the Black Friday sales by a week. It was phenomenal. I had never before seen people with SO many things in their carts. I just remember people with TWO carts FULL of clothes and toys. I had lived a pretty humble life, so the idea of going to K-Mart and filling up two shopping carts full of things to buy was completely foreign to me. I wasn’t smart enough to take these photos. Our human resource director, Sally, took these photos and put them in a photo album for us to look at when we were feeling nostalgic. Of course, when she moved to another store, the new human resource director basically threw the book away. I dragged it out of the garbage, however, and saved my favorites (some Halloween photos and these two). I feel as if Sally took those photos for me, personally. My Christmases at K-Mart were miserable 70 hour work weeks with no respite from the scanner and go-backs, but they financed my college degree. It was a lot of back-breaking work, but also a lot of fun memories. I love K-Mart. Maybe I should go there just once this holiday for old times sake.